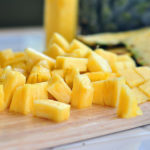 After taking the plunge to finally learn how to cut up a pineapple, I decided I should take my new confidence and learn how to work with other fruit I may have been intimidated with. The first one that came to mind was was the mango. I figured it was a good time to learn, so I could also feed it to Judah. 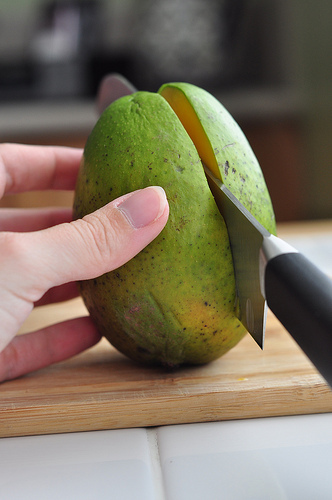 First, take the mango and use your knife to find the flat pit. 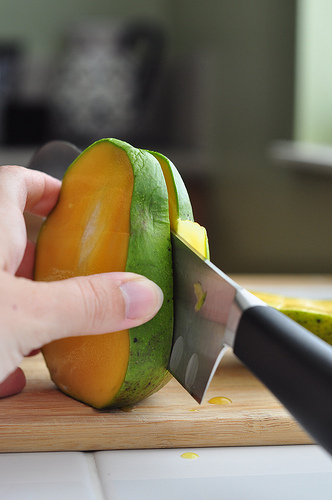 Cut through the mango lengthwise down both sides of the pit. 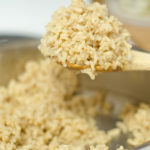 Use a paring knife to create criss-cross incisions without slicing through the peel. 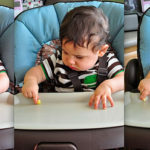 Invert the diced peels with your thumbs. You can now either pull the pieces off with your fingers, or use the knife to cut them away from the peel. 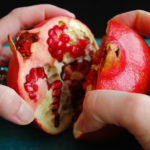 When I first went to Haiti, a missionary colleague warned me to be very careful when I ate a mango so that I wouldn’t accidentally swallow the seed! Well, when I cut into my first mango, imagine my surprise when I saw how huge it was! The joke was on me! The way you show how to cut them is the same way the Haitians do it. Only difference is that they eat it right off the “half shell” and don’t bother to slice them off. Thanks for the memories of Haiti in this posting! Just a warning to the eating the mango off the “half shell” comment. If you are allergic to poison ivy this is a bad idea. 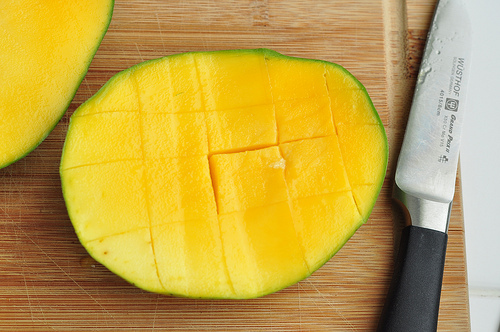 The mango skin has the same oil that poison ivy produces. 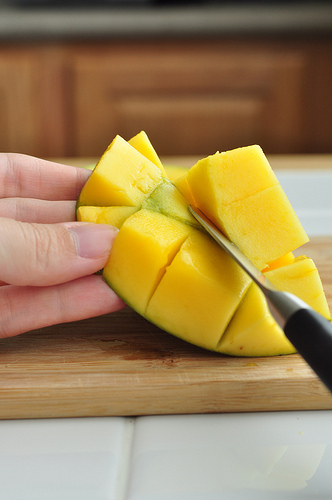 This can leave you with a large allergic reaction when eating mango off the shell and touching your face. I didn’t know this until I tried it and my face blew up like a balloon! 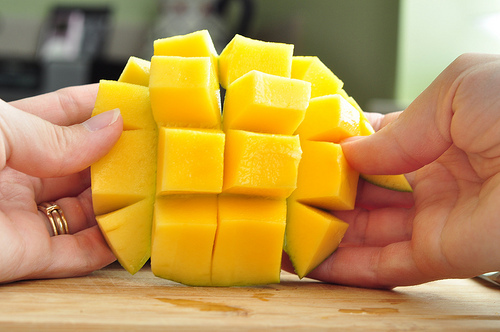 cool thanks for the tip the i cut my mangos is horrible i’ll try this today! 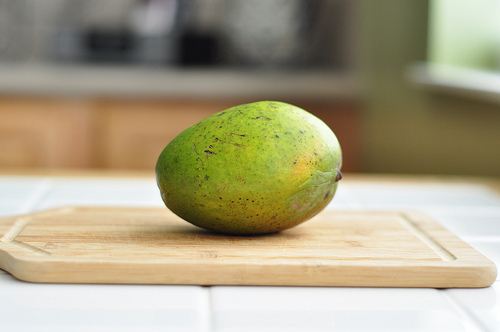 I was taught by my mother’s Queensland family when I was barely tall enough to reach, that the only way to eat a mango (picked ripe from the tree in the backyard) was over the kitchen sink (or the laundry trough or the bathroom hand basin or…). Mind you, they didn’t know the criss-cross technique.